A tale of two friends who share the same passion for the crown. Just across from the castle where Prince Harry and Meghan Markle's ceremony took place, two women are smiling, chatting and laughing like old friends in front of a make-shift home they've created. American Donna Werner and Brit Faith Nicholson have known each other for six years, but this is only the second time they've seen each other in person. They met in 2011 when they were camping out for four nights in London for Prince William and Kate Middleton's wedding. They became fast friends and pledged that should the then-single Prince Harry marry, they would reunite and witness his nuptials together. Six years later, they have the best seats on the streets of Windsor ahead of Saturday's historic event. Werner flew in from New Fairfield, Connecticut, this week while Nicholson hopped on the hour long train from London. 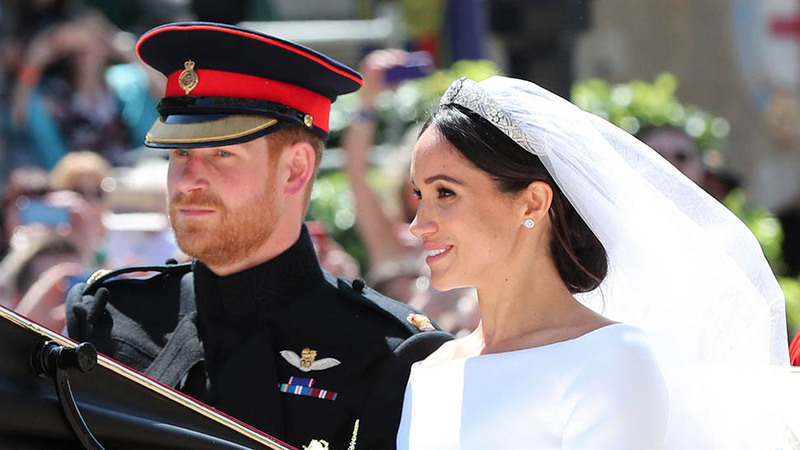 "We made a pact that when Harry got married, we'd be back," says Nicholson, 56, sporting Union Jack earrings, sunglasses and headgear. "Donna got to Windsor yesterday [on Wednesday]. We'd been agonizing over where the best spot was and going back and forth, Donna picked this spot and it's perfect." There is a no-tent rule in Windsor, so the women have been sleeping in fold-up camp chairs. 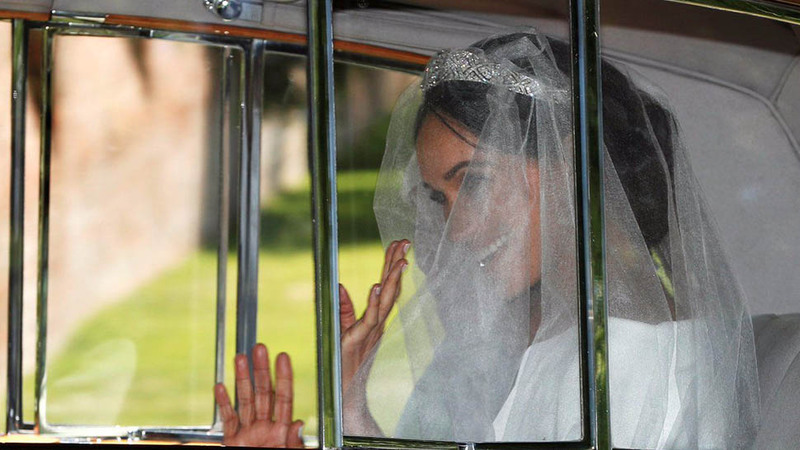 By the time Harry and Meghan Markle say "I do," Werner and Nicholson will have spent four days and three nights without a bed just to catch a glimpse of the newest royal newlyweds. They've set up five camp chairs complete with blankets to get them through the chilly nights. 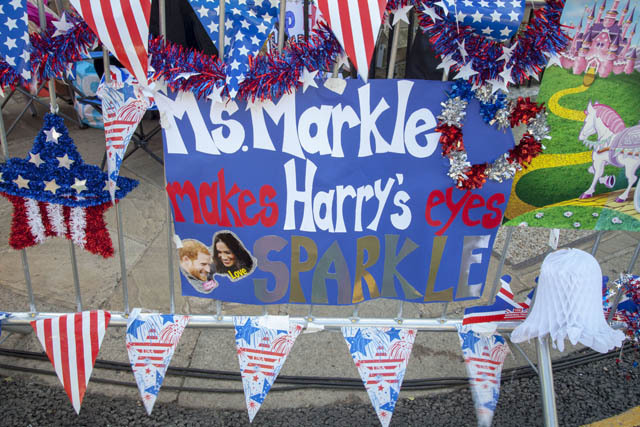 A Union Jack flag bunting has been carefully attached to the wall of a building to serve as a decorated backdrop, and a homemade glittery poster bearing the message "Ms Markle Makes Harry's Eyes Sparkle" is draped with both American and British flags and hangs from the security railings. These silver barriers, of course, cordon off the two women's temporary home from the road where the prince and Markle traveled in the Ascot Landau carriage as husband and wife after their ceremony finished on Saturday. The royal watchers have stayed in touch over the years through Facebook, which has allowed them to get to know each other's families, too. 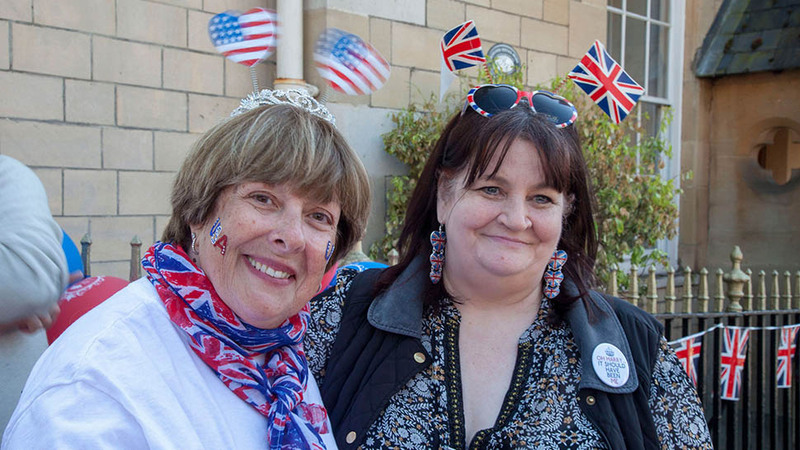 "Actually, since the last time we met, we both became grandmothers," says Werner, who is in her 60s and sports a glittered "USA" temporary tattoo on her face and American-flag mouse ears. "So, we've sent pictures of our grandchildren to each other and talked about the different things going on in our lives." 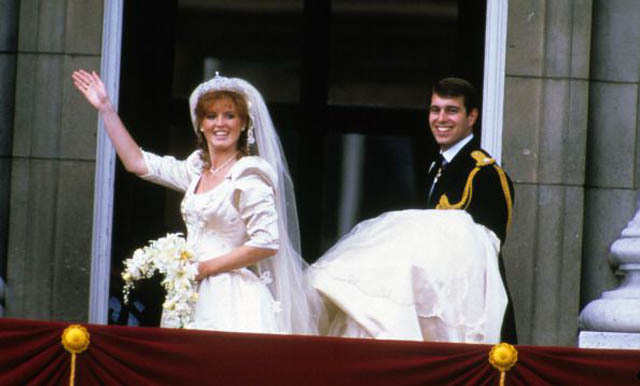 Nicholson is a little disappointed the wedding was closed off from the public view but, thanks to Werner's choice of position, they were some of the first members of the public to see the couple go past in the royal procession shortly after they've made their vows. They think the cold, uncomfortable nights were completely worth it. "The first event I came to was Fergie and Prince Andrew's wedding [in 1986] and I loved it," Werner says. "I slept on the street for a couple of nights, and I was actually pregnant with my son at the time!" "I got the itch and I continued to come back," she says. "I love England. I've been coming once or twice a year since I was 18, and I just love the country. It's absolutely gorgeous: The countryside, the little villages with the churches, the people, food, history and, of course, the royalty." 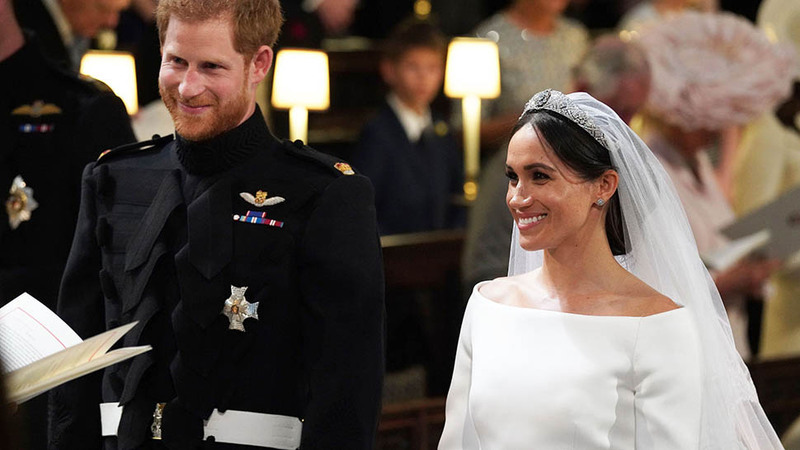 Given Werner's passion for all things Britain, surely she's especially thrilled that Prince Harry's bride is an American, as Markle is from Los Angeles, California? "It's funny, a lot of people are focused on that, but personally I really don't care," she says with a shrug. "I think it's nice, I've followed Harry since he was born. We've seen a lot of ups and downs from school, college years, military, different girlfriends and I think he's finally found himself. He's found where he belongs and a woman who loves him. To me, that's the most important thing. It's not just weddings that Werner has made the transatlantic plane ride for. 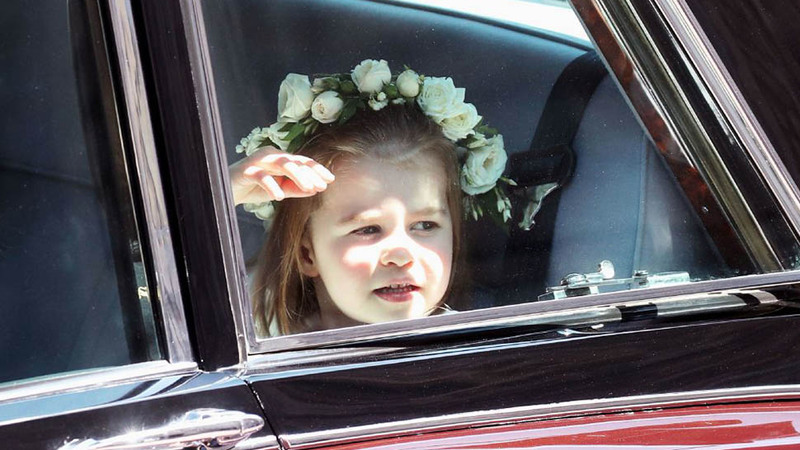 In 2016, she traveled for Queen Elizabeth's 90th birthday celebrations. She'd hoped Nicholson would be able to join her for that occasion but she was working. 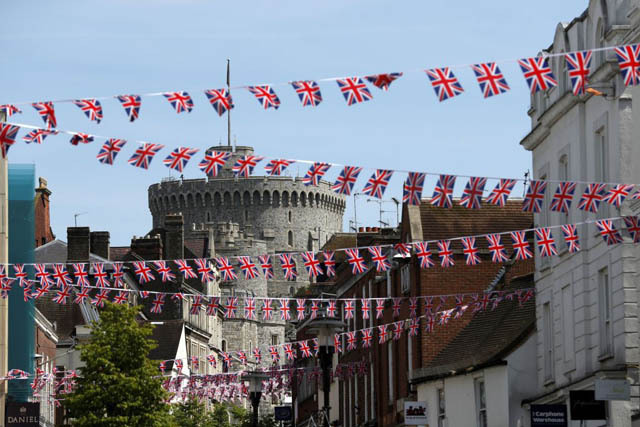 Instead, Werner connected with other royal-watching friends she'd met over the years, and the group met up to watch the Queen's walkabout in Windsor. The two royal aficionados are happy to have each other on these adventures since their families haven't joined in on the fun. 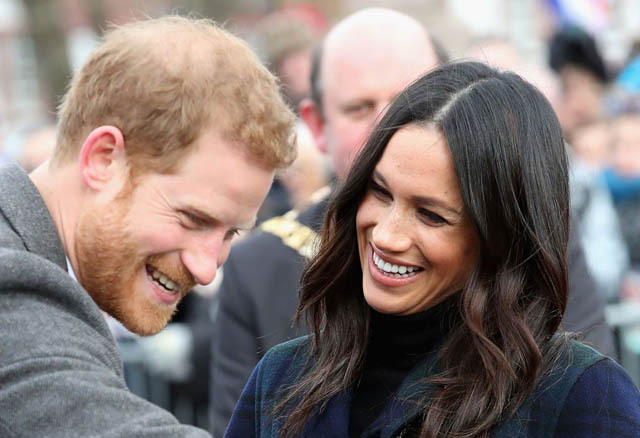 Both women laugh when they agree that their adult children think their royal obsession is slightly kooky. "My family think I'm crazy!" Werner says jovially. "They really do, but they're getting a kick out of it. They roll their eyes and go: 'Oh, Mom, she's off again.'"